It's possible to grow lime trees from seeds, but the fruits purchased from retailers are usually picked green, meaning that the seeds will be tiny, misshapen and too immature to sprout. Seedling citrus also have an extended juvenile period; it takes 7 to 10 years for them to produce fruit, and they often don't grow true. Seedling citrus trees tend to grow taller and leggier than grafted specimens, and they’re extra thorny. 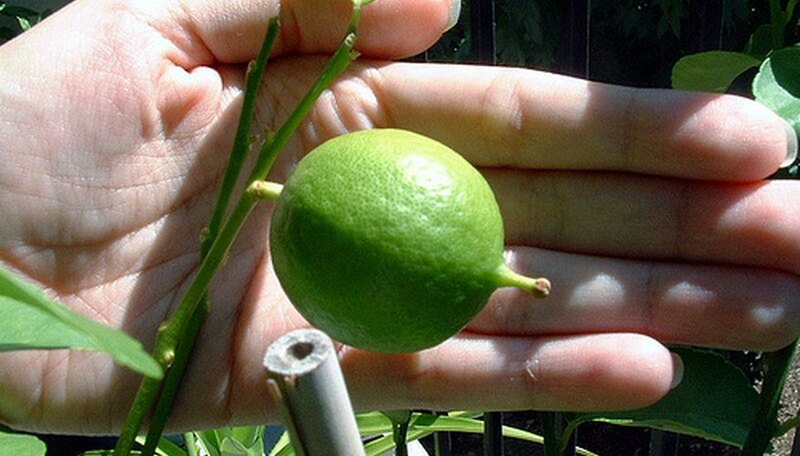 The one exception is the key lime, which grows true to seed, is a manageable size and fruits abundantly in two to three years. Peel a key lime and section it, rather than cutting it in half with a knife, to avoid damaging the seeds. Carefully remove the seeds from the sections with your fingers, being careful not to nick the coatings with your nails. Rub them between your fingers under cool running water to dislodge any remaining flesh, and soak them overnight in a glass of water. Fold a thick, soft paper towel in half, then into quarters, then into eighths. Moisten it with a plastic spray bottle, but not so much that it’s wringing wet. Lift the top edge of the paper towel and place three or four seeds under it, spaced about 1 inch apart. Cover them with the top flap of the towel and gently press the packet with the palm of your hand to firm them into place. Put the seed packet into a folding-top plastic sandwich bag and leave it open. Place the packet in a warm spot with plenty of bright, indirect light to germinate. Good locations include the top of your refrigerator, or above a hot water heater. Don’t put the seeds in direct sunlight. They should begin to sprout in ten days to three weeks. Check on your lime seeds about once a day to make sure that the paper towel hasn’t dried out. It should remain uniformly moist, but not wet. Give the packet a light spritz of water when it begins to feel a bit dry. Transplant the lime tree seeds into individual, 2-inch planting containers filled with a good, well-draining, sandy potting mix when a stem, the root and two leaves have fully developed. Moisten the surface of the medium and place the pots in a shallow water tray. Set the tray of seedlings on a warm windowsill where they’ll receive lots of bright, filtered light. Keep them uniformly moist, but never wet. Lime trees love warmth, bright light and well-drained feet.